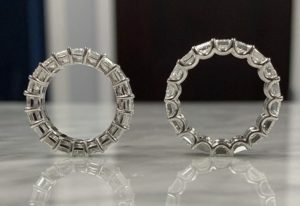 Because we specialize in custom orders, our office receives a wide range of request….Rings, Earrings, Pear Shapes, Round Shapes, Micro, Large, and Everything in Between! But, everyone loves the Emerald Eternity Band. Such a beautiful and bold statement. It is one of single most inquired about items. No matter your budget, we can make one to fit yours! 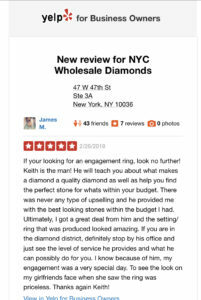 A Big Congratulations to Our Latest NYCWD Couple! Thank you Lachlan Edwards, of the NY JETS, for the honor of making this beautiful ring! Lady Gaga makes Oscar’s Red Carpet history by wearing the most expensive piece to ever grace the event! While there were many celebrities who wore stand out pieces at last night’s 2019 Oscars, there was one that stole the show! A 128+carat Cushion Cut Yellow Diamond worn by Lady Gaga. The 128.54-carat Tiffany & Co diamond necklace was last worn by the one and only Audrey Hepburn back in 1962 in publicity posters for Breakfast At Tiffany’s. The necklace, which is called “the Tiffany diamond” hasn’t been worn much since then either. Before it graced Audrey’s neck in the ’60s, it was first worn at the 1957 Tiffany Ball by Mrs. Sheldon Whitehouse and later made its first red carpet appearance at the Academy Awards when Gaga, 32, walked the red carpet with it on, so the necklace has only been worn a mere three times! Charles Lewis Tiffany first purchased the stunning rock for $18,000 when it was first discovered in South Africa in 1877. Although the necklace costs about $30 million today, it was previously put on sale in 1972 for $5 million, but, unfortunately, no one placed a bid, so today, the Tiffany diamond travels to jewelry fairs and museum exhibitions around the world. Along with the priceless diamond, Gaga wore a beautiful Alexander McQueen dress with leather gloves to the Oscars and, during the event, she never took the Tiffany diamond off her neck for the entire night. When she walked onstage with A Star Is Born co-writers Marc Ronson, Anthony Rossomando and Andrew Wyatt, everyone in the audience could see Gaga’s rare piece of jewelry shimmering from the stage. 88+ Carat D color, Flawless Diamond set to hit auction! 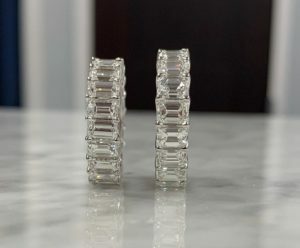 Sotheby’s auction house will be offering an 88.22-carat, flawless diamond as the top lot of its Hong Kong Sale of Magnificent Jewels and Jadeite on April 2. The D color, flawless, oval brilliant gem has an estimate of $11.2 million to $12.7 million. The auction house is calling the stone “perfect” based on “every critical criterion” that diamonds are measured. It has received the highest ranking for color, clarity, cut, polish and symmetry. There are few diamonds ever offered at auction of more than 50 carats that have all of these qualities. 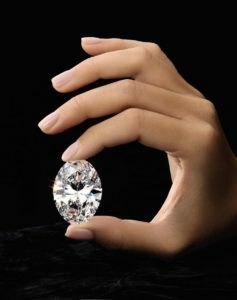 In fact, it is one of only three oval diamonds of over 50 carats to appear at auction in living memory, and the largest to be auctioned in over five years, Sotheby’s said in a statement. The finished diamond was from a 242-carat rough stone that was discovered in the Jwaneng mine in Botswana, jointly owned by De Beers and the government of Botswana and known for producing high quality roughs. Following its discovery, the rough was cut and polished over a period of several months to produce a symmetrical oval brilliant diamond. Sotheby’s said given the elongated shape of the rough the oval shape was chosen to preserve the greatest amount of weight. So it seems appropriate that the diamond will be offered in Hong Kong. 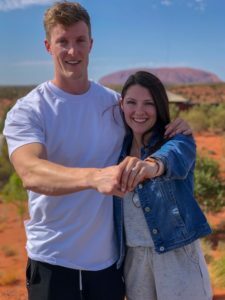 Although we are not very far into 2019, the new year has already produced some quite impressive Engagement Rings. Celebrities and their fashion have always had a way to set the trends to come, and their engagement rings are no different! 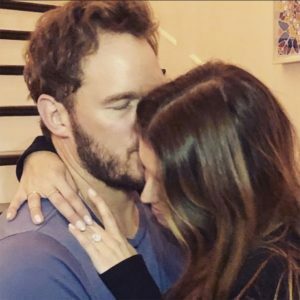 So here are some of Hollywood’s couples who have recently gotten engaged, and we are here with the blingy details. 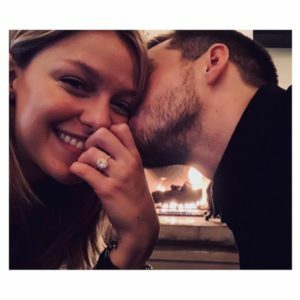 The Supergirl actress said YES to co-star Chris Wood and this on trend sparkler. The center is an Oval Diamond that appears to be around the 3ct mark. It is set with a halo on a pave band. The two announced their engagement on Instagram on January 14, and showed us some serious bling! 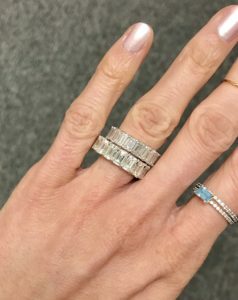 While they have not commented on the ring, it appears to be at least a 5ct Cushion, set on a super thin diamond band and a matching petite style pave halo. The former NFL quarterback and 2017 Miss Universe got engaged in front of family and friends shortly after the New Year. 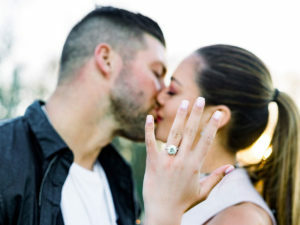 The ring is a 7.25ct Round diamond that Tebow has confirmed is Internally Flawless.